On this day in aviation history (March 13th), Edward “Butch” O’Hare is born in 1914. He was the first flying ace in the U.S. Navy and the first naval recipient of the Medal of Honor recipient in World War II. O’Hare was born and raised in St. Louis, Missouri. His father, who lived in Chicago, was first lawyer to Al Capone and then witness against him. O’Hare attended the United States Naval Academy at Annapolis, Maryland. He graduated in 1937 and after serving as an Ensign aboard the USS New Mexico for two years, he went to Pensacola, Florida to begin his flight training. 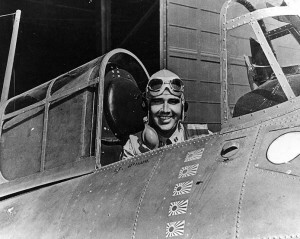 O’Hare was called to duty from his honeymoon the day after the Japanese attacked Pearl Harbor. On February 20, 1942, while fighting in the Pacific Theater, O’Hare single-handedly defended the aircraft carrier USS Lexington from an attack by 9 Japanese bombers. Despite having limited ammunition, he was able to shoot down or severely damage several of the enemy planes. Later analysis would show he used an average of 60 rounds per downed plane, considered by experts to be an amazing feat of marksmanship. His actions are believed to have saved the Lexington from serious damage and possibly even loss. This feat of expert flying resulted in the Medal of Honor being bestowed on him later that year. Sadly, in November of 1943, O’Hare was lost while leading the first-ever nighttime fighter attack launched by the U.S. Navy from the deck of an aircraft carrier. His plane, the F6F Hellcat, was never found. Two years later, in 1945, the U.S. Navy destroyer USS O’Hare was named for him and then in 1949, the airport in Chicago, Illinois was renamed to O’Hare International Airport as a way to honor his bravery. Chicago Airport – Second Busiest in U.S.
Today, O’Hare International Airport is the main arrival and departure airport in the Chicago area, the second busiest airport in the country, and the fifth busiest airport in the world. More than 66 million passengers (private jet charter and commercial) fly in and out of O’Hare International Airport each year and the airport has been named the Best Airport in North America 10 times.